My wardrobe for fall is filled with neutrals; in fact, one of my fears about having a "capsule wardrobe" for fall was that I would get bored with the lack of color. However, I don't think that will happen, because I have so many bright, colorful accessories to balance out all the neutral hues. Thanks to Ross, I have one more to add to my collection: this red crossbody bag. Like a clutch, it's perfect for occasions that don't require all of my stuff (e.g. date night), but unlike a clutch, it's hands-free. I love hands-free bags. Classic, neutral pieces with bright accessories are what I'm loving for fall right now. On the Ross Facebook page, they're sharing some of their favorite fall blogger looks; be sure to check it out and vote (and enter to win a $150 gift card)! 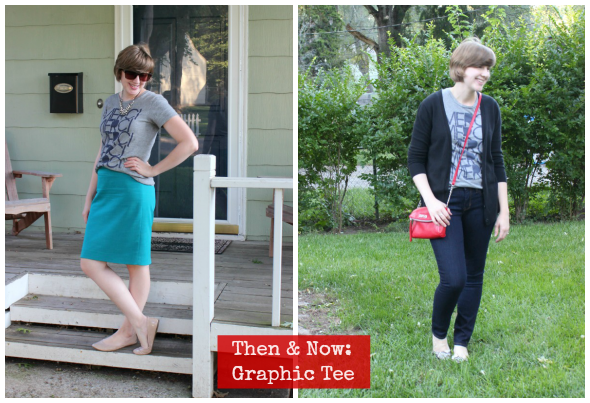 When the weather was warmer earlier this month, I also paired this graphic tee with a bright color: my turquoise blue pencil skirt. I received a gift card from Ross for this post. I love both of these looks! I wish we had a Ross in Minnesota, you always have such cute stuff from there! gorgeous bag - versatile and stylish. it looks similar to the kate spade cross body bags i've been crushing on! I love both stylings, but especially the gorgeous red bag - it will be such a perfect pop of color to add to your outfits this fall.